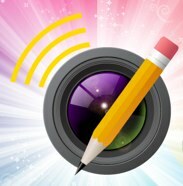 I must admit I lost interest in screen capture utilities once I got comfortable with Skitch. It is such an easy-to-use application that I simply stopped looking. A few months ago some of the nice people at Global Delight asked me to look at their screen capture utility, Voilà. I was skeptical at first but after using it for a month I must admit I am impressed. Voilà goes much farther than a traditional screen capture utility. It takes advantage of many of the core graphics functions in OS X to provide the user interesting ways to capture, edit, organize, and share screen captures. When capturing screenshots with Voilà you have several options. In addition to rectangles, you can capture others geometric shapes such as circles, polygons, and even freehand. You can also capture menus, objects, and a full screen. You can even time the captures so you can place your mouse at exactly the right position before the shot is taken. Voilà also captures images from your iSight camera or third-party web cam. One interesting feature is the ability to make multiple selections and take several screenshots with one snap. If you are looking to capture specific webpages, you can type in the URL and use Voilà's built-in web browser to take a shot of the complete page. If you are a web developer, you can also take shots of specific DOM elements. Once you capture your image, Voilà will handle just about any type of editing tools you would require with a screen capture. In addition to the obligatory resize and crop tools, you can blur sensitive information, insert text annotation, and add variety of arrows, lines, and shapes to help get your point across. There are also edges and filters you can apply. I was particularly impressed with its ability to skew an image. Voilà uses Apple's common paradigm of organizing data with a left column group of folders. It includes its own categories including such things as screen snaps, camera snaps, and imports but also allows you to make your own collections including smart criteria such as date, URL, tagged and annotation flags. Once you have your images edited and organized, you can share them easily via Apple Mail or Microsoft Entourage with one click. You can also configure it to talk to your FTP and Flickr accounts. While there did not appear to be anything particularly revolutionary about Voilà's sharing abilities (most screen capture utilities these days have them in one form or another), they were easily configured and reliable. Two years ago, it was unimaginable to conceive of editing functions this deep in a screen capture utility. But times, they are a'changin. There is a healthy competition with some excellent screen capture utilities. Voilà presents a feature rich, stable option. You can purchase it at globaldelight.com for $39.95. There is a 30 day free trial. As to the question whether you want to spend $40 on a screen capture utility, there is no simple answer. If you're satisfied with the built-in screen capture tools in OS X or free applications, like Skitch, you are probably fine. If, however, you're finding yourself exporting screen capture images into higher end photo editing software, getting a beefier screen capture tool is worth investigation and may be worth the investment.